Tom and Lori McKenzie like to go to rock concerts and watch Minnesota Wild games, and they’re not sure they act much like the parents of a future priest. “We don’t fit the stereotype of priests’ parents — whatever they think, we’re not that,” said Tom as the couple relaxed with a beer on the deck of their Maple Grove home on a recent May evening. Their son, Deacon Thomas (T.J.) McKenzie, is one of seven men who will be ordained to the priesthood for the Archdiocese of St. Paul and Minneapolis May 30 at the Cathedral of St. Paul. It’s not clear whether Tom and Lori, members of St. Vincent de Paul in Brooklyn Park, are “typical” priest’s parents, but there’s no doubt they’ve been involved and supportive of their son and other seminarians at the St. Paul Seminary throughout his six years there. In the process, the couple says they’ve grown in their own faith. 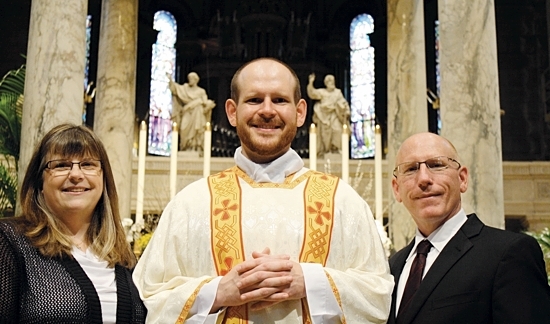 As ordination approaches, along with their daughter and two other sons, they look forward to having a priest in their close-knit family, though they doubt it will change much. The McKenzies have few visible signs of the faith in their home, but they’ve tried to pass on lasting values, Tom said. When Deacon McKenzie was in grade school, Lori remembers bringing up the idea of priesthood. While considering seminary, Deacon McKenzie also applied to study physical therapy — also Cortney’s field. “He would have been a great [physical therapist], but definitely being a priest he’ll be able to do more work through God’s hands in that realm and use more of his talents,” she said. The McKenzies had no qualms about their son going to seminary, but they wanted to make sure he was ready. When the couple travels, they now explore Catholic churches. “Now, no matter where we are on either a Saturday night or a Sunday, we’ll find a church to go to,” Lori said, adding that they always pray for their son and seminarians. In August, the future Father McKenzie will preside at his brother Riley’s wedding. “We expect that he’s going to have an awesome homily and will do a wonderful job at my brother’s wedding,” Cortney said.